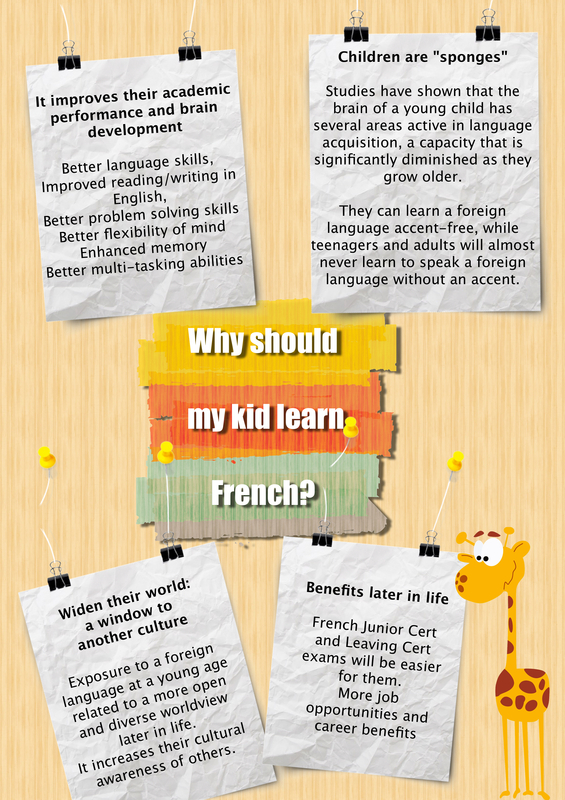 We offer French classes for children aged from 3 years old to 12 years old, with no or little knowledge of French. The maximum number of children in each group is 8, which allows each child to receive plenty of personal attention. French will be introduced through varied and stimulating activities, such as songs, arts and crafts, role-plays, mimes, board games and even baking! While vocabulary is important, we also aim to give children the communicative skills that will enable them to express themselves in French, as well as opening their mind to a new culture. Because every age is different regarding interests and skills, we have 3 different classes for children: 3 – 6 years old (or up to Senior Infants), 6 – 8 years old (from 1st class to 3rd class), 9 to 11 years old (from 4th class to 6th class).